Between the weird scheduling of the match on a Thursday night, the questionable officiating, depleted rosters, and the rather languid play, last night's match between the Houston Dynamo and Real Salt Lake took the "beautiful" out of the beautiful game. 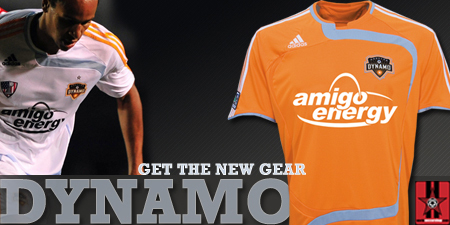 Until the final seconds of the match, it appeared that the score would stay at 0-0 and the Dynamo would have to wait until September 29th to finally pick up their first MLS home win since August 3rd, but then Macoumba Kandji was fouled in the box and Colin Clark converted giving the Dynamo a 1-0 win and breaking their 4 match streak of not winning an MLS match. Going into Thursday's match, things did not look promising for the Dynamo squad, which had been decimated by injuries, international call-ups, and some sort of vicious stomach virus. Instead of starting the match with the typical 7 substitutes on the bench, the Dynamo managed to only put 5 players on the bench and had to cancel the reserves match due to the lack of available players. For over half of the match, it appeared that the Dynamo were in a preventive defense, just trying to hold off the Salt Lake attack in hopes of picking up a draw. Late in the second half, the Dynamo managed to regroup and put more pressure on Salt Lake Keeper Nick Rimando, who put on a stellar performance that surely foreshadowed his future at the international level. 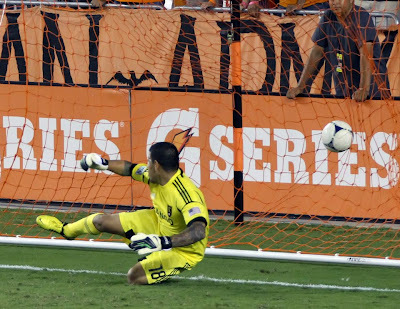 Hope of a goal appeared in the 75th minute when Will Bruin picked up a penalty, and Brad Davis was given the green light to take the kick, but, to the chagrin of Dynamo fans, Rimando, who is one of the best keepers in the MLS at saving penalty kicks, prevented Davis' attempt from going into the net. In the end though, Rimando turned out to be his own worst enemy because he was the player that fouled Kandji, thereby setting up Clark's match winning penalty kick. The 3 points that the Dynamo picked up last night will potentially prove crucial as the Dynamo fight to ensure the squad a spot in the MLS Cup playoffs. Next up for the Dynamo is a visit to Livestrong Sporting Park to face the current leaders of the Eastern Conference, Sporting Kansas City, on Friday September 14th at 7:00 pm cdt. The match will be televised on NBC Sports Network.